Looking for accommodation in Croatia? Apartments, hotels, rooms and vacation houses; direct contact, descriptions, pictures and prices. Prijava smještaja: oglašavanje je besplatno! For the full experience of the site, please use desktop-version. Apartment Sweet dreams, owned by the Dedic family, is located in Stari Grad (Split-Dalmatia County). 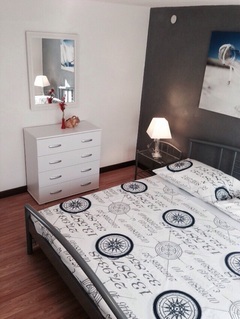 Accommodation is located 700m from the closest beach and 700m from the centre. One accommodation unit is suitable for minimally 2 and maximally 3 people. The guests have available: balcony/terrace, garden plot, silverware and kitchen utensils, sat-TV, Internet access, air-conditioning, heating, linens, towels. What to see & do : Tvrdalj of Petar Hektorović in Stari Grad (right) is the fortified mansion of Petar Hektorovic, the poet (1487-1572), the author of the first realistic epic poem of Croatian Renaissance literature "Fishing and conversations about fishing"
Remains of ancient town Pharos in Stari Grad (left) - Stari Grad, the oldest town on the island and one of the first in Europe, was founded by the ancient Greeks in 385/384 BC as an independent polis of Pharos. The church of St. Stephan in Stari Grad (right) was built in the 17th and 18th century. From Split you can take a car ferry to Stari Grad.